New directions with a quarter turn. On a heavily shaded, rambling site, this two-storey 1930s house required careful reworking of its complicated and poorly lit interior, to deal with a south-eastern aspect and forge a meaningful indoor/outdoor connection. The dwelling was built in what is sometimes called the Stockbroker Tudor style, so named because their original owners made money on the 1920s stock market, and the houses they built reference the Tudor revival style associated with the Victorian era. Characterised by towering facades, monumental scale timber staircases, and curved walls and detailing, this home is very much of its type, being one of a number of similar houses dotted across Sydney’s North Shore suburbs. 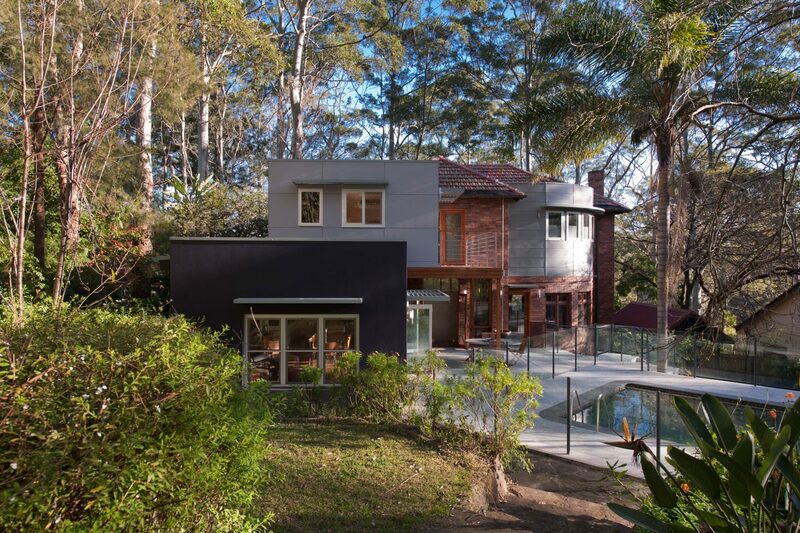 Nestling under the canopies of angophoras and grey gums, the dwelling and its existing material language was revived through various juxtapositions with contemporary yet complementary materials, colours and finishes. In particular, the red-brown brick is rejuvenated through the use of zinc added to the curved rear facade. The floor plan was extended and updated, with internal spaces hinged around a new kitchen and dining area, opening directly to a covered patio. The interior scheme reflects a richness of colour and texture, drawing from our clients’ art glass collection and the stained glass windows of the original dwelling. A terraced patio and pool deck area is articulated by frameless fencing, a textured wall and illuminated planter boxes. Rendering, painting and lighting refurbishment works also assisted in modernising the dwelling.